Finalists one year ago but impossible this year both being in the same quarter of the draw; nevertheless both India’s Sathiyan Gnanasekaran, the winner and the host nation’s Cédric Nuytinck, the runner up, made positive starts to their campaigns in the Men’s Singles event at the 2017 ITTF Challenge Belgium Open in De Haan on Thursday 2nd November. Positive starts but hard fought starts were the order of proceedings. Cédric Nuytinck, the no.7 seed, beat Germany’s Dennis Klein in six games (13-11, 11-7, 10-12, 10-12, 11-9, 11-8), by a similar margin Sathiyan Gnanasekaran, the no.11 seed, accounted for Belarus teenager, Aleksiandr Khanin (11-4, 11-6, 18-16, 13-15, 10-12, 12-10). Success for Cédric Nuytinck and Sathiyan Gnanasekaran, there was also success for the principal names as play progressed in the lower half of the draw in the Men’s Singles opening round. Furthermore, there was more success for India; Sharath Kamal Achanta, the no.3 seed, beat Scotland’s Gavin Rumgay (11-3, 11-8, 11-2, 8-11, 11-1). Impressive from Sharath Kamal Achanta, it was the same from Germany’s Ricardo Walther, the no.2 seed and from Korea’s Kim Donghyun, the no.8 seed. 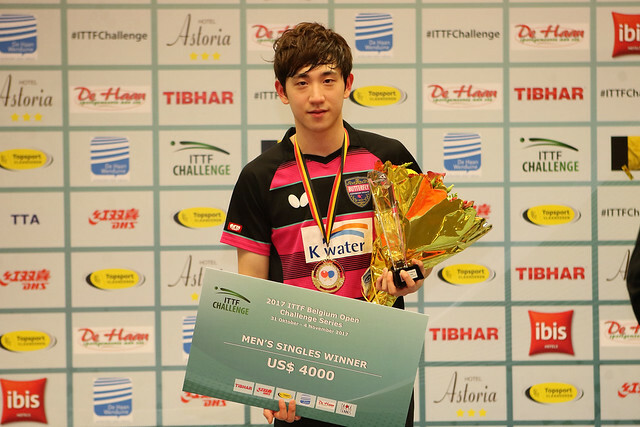 Ricardo Walther overcame Hungary’s Nandor Ecseki (11-6, 11-3, 12-10, 13-10), Kim Donghyun halted the progress of Portugal’s Zhao Tianming (11-8, 11-9, 6-11, 11-5, 11-6). Matters very much as status predicted but as the opening round of the Men’s Singles event came to a conclusion, there were defeats for two seeded players. The Czech Republic’s Michal Obeslo, the no.18 seed was beaten by Paraguay’s Marcelo Aguirre (11-5, 11-7, 11-8, 11-5); Sweden’s Harald Andersson, the no.17 seed, lost to Spain’s Carlos Franco (9-11, 9-11, 11-5, 11-6, 11-9, 11-7). Defeat for Harald Andersson and there was a close call for his colleague, Victor Brodd; the no.26 seed, he needed the full seven games to beat Puerto Rico’s Bryan Afanador (9-11, 11-9, 8-11, 11-8, 8-11, 11-5, 11-7). Testing times for Victor Brodd; it was the same for India’s Sanil Shetty, the no.23 seed; he was extended the full distance by Pavel Platonov of Belarus (4-11, 4-11, 11-6, 10-12, 11-6, 11-6, 11-6).